They are giving away 3 sets of stamps to one lucky winner that comments on all blogs and it is your option to subscribe to all the blogs in the hop but to gain an extra entry you can subscribe to their blog at ADDICTED TO STAMPS and let us know that you did. Again, be sure your email coordinates with the one you used to comment on so we can contact you. And here is my supply list! Email me if you are interested, ZERO risk & Nothing else to do after joining! Your card is very pretty, Tina. I like the sketch you used. 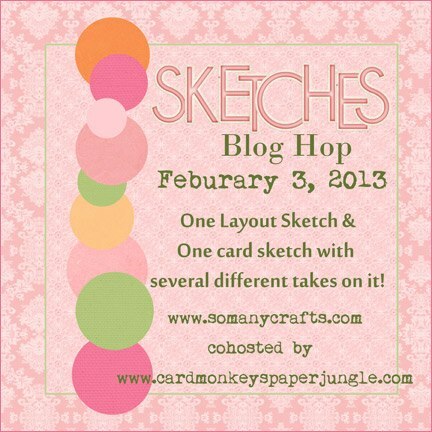 Thank you for joining in on the Sketch Challenge Blog Hop! P.S. — Tina, could you please update your link to Robin? You have a bad address for her. 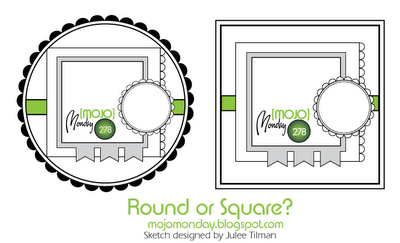 It is http://www.scrapandchat.blogspot.com. THANK YOU! Love your card. Love the colors. Very springy. Tina just love the card, your colors are screaming summer to me, which I am so looking forward too!! Great card – fabulous papers. TFS. Fabulous card! Love the spring/summer colors, so bright and vibrant. great interpretation of mojo sketch.